February is nearly here. No matter how much you want to heat up your house, one of the best tools you have to stay comfortable for the rest of winter is a space heater. Using your furnace or your HVAC to keep your whole house warm could get costly or uncomfortable. It dries out your house’s air, which can irritate the mouth and lungs or make preexisting colds worse. 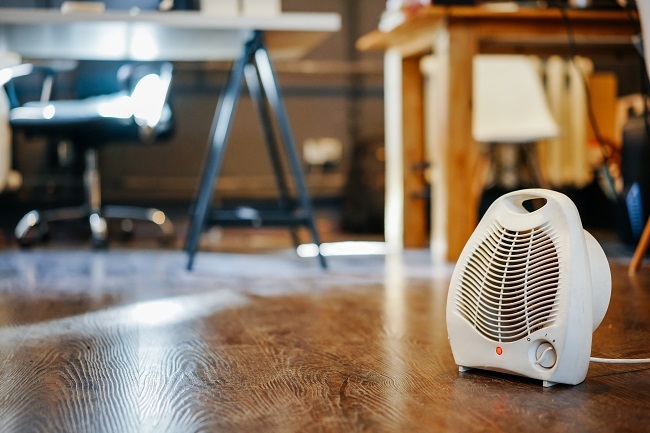 If you spend most of your time in one room or behind your office desk, ease off the central air conditioning and use a space heater for more fine-tuned temperature control. Here are two tips to keep your space heater safer and easier to use. 1. Maintain good electrical safety. Even tiny space heaters use up a lot of power. Make sure your electrical connection is as secure and safe as possible before using a space heater for a prolonged period. Instead of using an extension cord or a power strip, plug your heater directly into the socket. If you’re pulling an old space heater out of storage, make sure the cord is in good condition and that there is a grounding component. When you pull your space heater, check it for any dust and fuzz that might heat up and cause a fire. Everything builds up a layer of dust, including the interior, and you may need to use a can of air to blow everything clear. 2. Make sure it isn’t a trip hazard. Even if your space heater comes with a relatively long cord so you don’t need an extension, take precautions. Always use the socket closest to where you’ll be sitting. If the socket isn’t available, make sure to protect the cord by running it along the perimeter of the room or by securing it down so no one can trip. Space heaters might be small, but they can be dangerous. Go to Tri County Air Care for more tips about how to stay safe and warm through the rest of winter.